This recipe was the brainchild of a freezy, lonely Saturday and a bunch of leftovers in the fridge/freezer. I was very uninterested in leaving the house so I decided to throw this all into a soup and see what happened. Result: very good things happened! 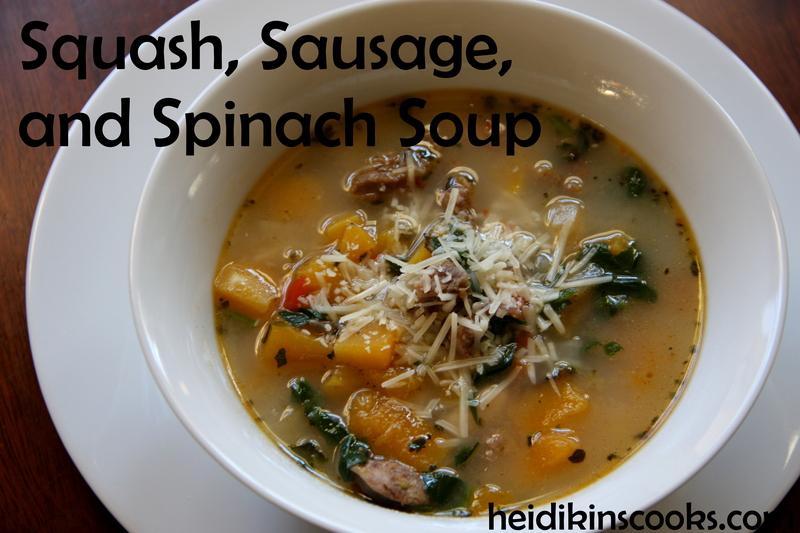 I really like the mix of buttery squash, broth, and sausage, and the bright green spinach makes it so pretty! Poke holes in the sausage links with a fork and place in a small frying pan over medium heat with enough water to almost cover the sausage. Bring to a boil and simmer for about 10 minutes, turning once, until the sausage is cooked through. Remove from pan and let cool. When it’s cool enough to touch, slice it into circles and then quarter each circle for small little pieces of sausage. Peel the butternut squash and dice into 1/2″ cubes, dice the onions and bell pepper. In a large pot (6 quarts or so), heat the olive oil and then saute the onion and bell pepper for 3-5 minutes, add the sausage and all the ingredients except for the spinach, cream, and Parmesan. Bring to a boil and simmer for 30 minutes until the squash is tender. Taste your seasonings, add anything that seems missing (salt, white pepper, or red pepper flakes will kick it up if it needs it!). Remove the bay leaf, add the spinach and cream and let simmer until the spinach is just wilty. Remove from heat and serve with a bit of Parmesan over the top. The only thing I really wished I had with this was a warm slice of crusty French bread…but that would have required going to battle with yeast, or with the cold weather. *You could also put this in a crock pot for 8 hours on low, adding the spinach and cream in the last 30 minutes.